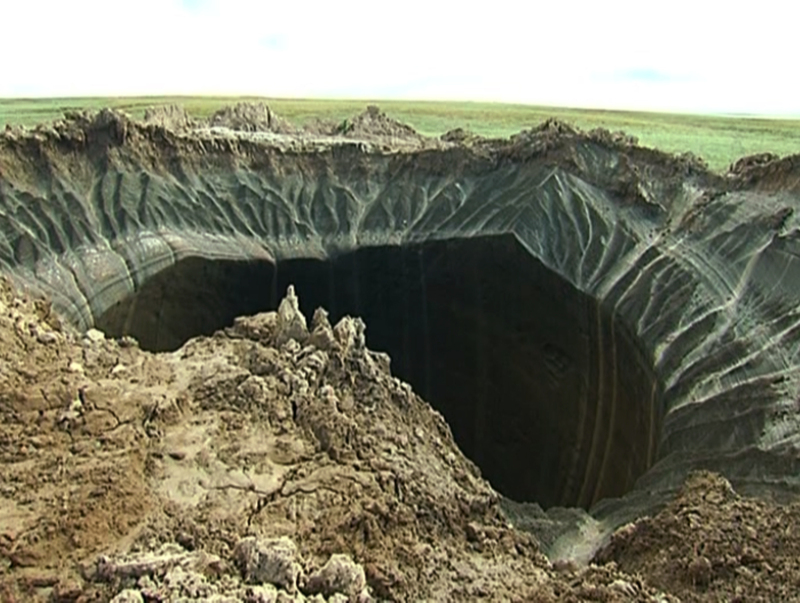 A massive crater has been discovered in Siberia, and might have been caused by changing temperatures in the region. Made out of mostly ice, scientists think that the hole is around 260 feet deep and some 66 yards wide. While they are not sure, researchers think the huge crater might actually be a result of global warming. The crater is located in the far northern Yamal peninsula in Siberia. Around the huge hole are black rings that make it look like it was caused by a fiery explosion or a meteorite slamming in the earth. Plekhanov, however, does not believe an external explosion caused the crater at all. “For now we can say for sure that under the influence of internal processes there was an ejection in the permafrost. I want to stress that it was not an explosion, but an ejection, so there was no heat released as it happened,” he said. Instead, he, and many other researchers, believe that the hole was caused by the melting of a pingo. A pingo is a large piece of ice that forms on the earth, and slowly gets pushed into the ground. Global warming could be causing that hunk of ice to melt, which would leave only a crater in the land. Whether or not this is true has yet to be seen, although global warming skeptics are no doubt going to refute Plekhanov’s claims. A video of the crater can be seen below or on YouTube. If the news feed was honest, a high altitude photo shows HUNDREDS of these thing in the area. Global Warm-meisters hang their hats on anything that leans in their direction, even if less than a million of one degree. Bingo the dingo ran over the pingo and the hey Russia why do all the cool natural phenomena happen over on your land? Send some meteors and sinkholes this way. OMG! It rained yesterday! it must be the result of global warming!!!! OMG! I have a pimple! It MUST be the result of global warming!!!!!! They already discovered this was a giant sinkhole caused by subterranean pressure being released. The honeybee population decline is due to pesticides. If you just call “global warming” for EVERYTHING the global warming-deniers get more ammo. But what caused that subterranean pressure in the first place? The most plausible hypothesis is that water seeping down melted permafrost, which released methane gas, which built up pressure until it blew its overburden off. Excuse me, but the claim is global warming is a driver of climate change. Although related, the two are different. Most people treat the two terms as synonymous. “Climate change” is the more precise of the two. They have the same cause: increasing concentrations of CO2 in the atmosphere. I agree that most people treat the two as synonymous. That is the fault of popular press and politicians. But, climate change is more than increase in temperature. Also, they do have the same cause, because of the causality principle: If A causes B, and B causes C, then A causes C.
And it might be the result of an earth fart, or giant mole men. Does anyone other than those that practice the global warming religion really believe these asinine words. The hypothesis that it is the result of release of methane from permafrost is far more plausible than the alternatives you propose. Indeed, of all the explanations I have seen, the methane release strikes me as most plausible — but we need more study before we can call it more than a plausible hypothesis. And yes, most people accept the reality of climate change. It’s only a fringe that denies it. So whatever happened to the very dedicated “flat earth” folks?